I"m continually amazed at the "new to me" things that I discover here in the Black Hills. I"ve lived out here for several years now, and up until yesterday - had never been to Roubaix Lake. It was my first time there, but it sure won"t be my last! Roubaix Lake is a beautiful little alpine lake located at almost 5,500 feet in southern Lawrence County. When we visited yesterday, there were a few other people scattered around the lake - fishing, swimming, hiking, bird-watching and just enjoying the pristine June afternoon. There is a nice, sandy beach on one side of the lake that looked perfect for kids to splash off some energy in the shallow water. Accessible changing rooms and restrooms were available nearby. Roubaix Lake is stocked with Rainbow Trout by the . The trout that GF&P stocks are usually in the "catchable size" neighborhood of 11-15 inches in length. There is a wooded campground at Roubaix Lake that has 53 campsites spread between four different loops. There aren"t any electric hookups at Roubaix campground, but many of the sites do have enough room for a trailer or RV. All of the campsites have fire grates and picnic tables for use. There are also six potable water hydrants in the area, so no need to pack in your own water. Because of its small size - only five acres - motorized boats are not permitted on Roubaix Lake, but it is perfect for non-motorized craft like kayaks or small canoes. 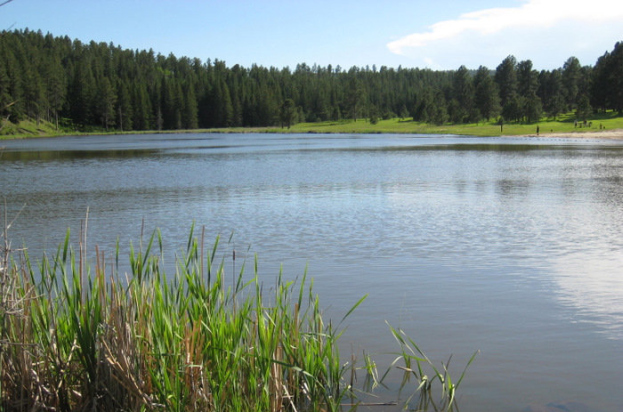 It is located on Forest Service Road 255 about 15 miles south of Deadwood. If you"d like to learn more about the recreation area at Roubaix Lake or to reserve a campsite of your own, visit Recreation.gov. There are hundreds of great places to camp or to just get away in the Black Hills and after my short visit yesterday, I think Roubaix Lake may be a frequent one for me in the future. It"s the perfect type of place for a quiet Friday afternoon with a fishing pole or a few days of peaceful camping in the woods. Joe is a resident of Spearfish, S.D. He grew up in the tall-corn state of Iowa, where he developed an early interest in all things outdoors. After high school he moved to Vermillion, S.D., where he earned his bachelor’s degree in public relations and advertising. During his college years, two things caught his attention: the beauty of western South Dakota’s Black Hills and a girl from those Black Hills. After graduating from college, Joe traveled across the country as a recruiter for the University of South Dakota. He saw the sights from Pittsburgh to Las Vegas and everywhere in between, but it was the Black Hills (and the girl) that kept drawing him back. He and wife moved back to the Black Hills in 2008. He's an avid hiker, mountain biker and road cyclist whose future plans include trying to fit a pair of kayaks into the spare bedroom.